I launched the open textbook project over a summer, and because I teach at a public university where I had no easy access to graduate assistants or funding, I hired a bunch of undergrad students and recent alums, and paid them out of my own pocket to assist me. Turns out, most of them were willing to work for free (I didn’t let them, though what I paid was low because it was all I could spare), and turns out the whole endeavor of building the work turned out to be transformative to my own pedagogy and to the course that followed. I want to share here the nuts and bolts of how we built the textbook, and reflect on how it affected the pedagogy that surrounded the book. I have basic WordPress experience, and since I am too busy with teaching to explore every cool new thing I’d like to, I wanted to stick with an easy tool to build the book. 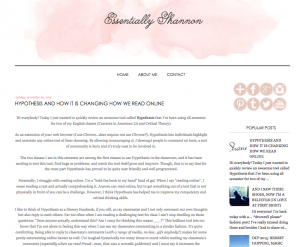 I settled on Pressbooks, which is a very simple, WordPress-based platform. If you are somewhat tech-savvy and comfortable playing around with things, you could definitely teach yourself the basics in an hour or so. I opened a free account and set up a framework for the book. Every section would feature a primary-source public domain document from the period, as well as an introductory context-setting piece. I created a GoogleDoc and posted a call for research assistants on the undergraduate English Department Facebook group at my university. Research Assistants (RAs) were paid $10 for every public domain text they retrieved and documented, and we tracked it all in the GoogleDoc. Each RA was also paid to complete a basic training on copyright and open licensing, so they understood the definition of “public domain” and understood how to ascertain whether a particular digital version of a text was under copyright. We started with the main texts that I wanted to cover in the course, based on what I had covered in the past using the Heath and other anthologies. Together over the summer, eight of us built the initial skeleton of the anthology: seven undergraduates (or recent alums) and me. In most cases, students provided the texts, and I edited and excerpted them myself, and then I loaded them into Pressbooks. When the Fall came, the course started and I introduced our rudimentary textbook to the crop of enrolled students, many of whom were aware of the project because their friends had participated in creating the book so far. What the book still lacked, which my undergraduates really wanted, was the front matter that is conventionally included at the beginning of each text, which generally provides historical and biographical context to help students engage more fully with the primary documents. So students in the course signed up to create these introductions as we went through the course. Generally, they submitted them in time for the class to use them when we covered the text in the syllabus, but they also often revised them after we discussed the text in class if they thought they could improve them. Students also did editorial work on the primary documents, particularly in terms of modernizing spelling, which was a helpful exercise for them in terms of learning how to read original early documents, but also helpful to future students, who can now read the texts more quickly in the modernized versions; in one case, this version is the only openly-licensed modernized version of the text that currently exists. In addition, students occasionally produced short films, discussion questions, and assignments related to the primary texts, and I have begun uploading those into the anthology as well. I am transitioning to a new department this summer, and doubt I will have time to really stick with this project (anyone can pick it up, of course, but I am also hoping to formally pass it to someone who will commit to building it out), but it’s easy to see the possibilities of how the collection could grow, and how the students could continue to add additional interactive materials. So many of you are thinking, “That’s great, but my field isn’t comprised of public domain literature that I can just copy and paste into a book.” Well, let me tell you about my second textbook project! The book I am currently working on is a different animal altogether. 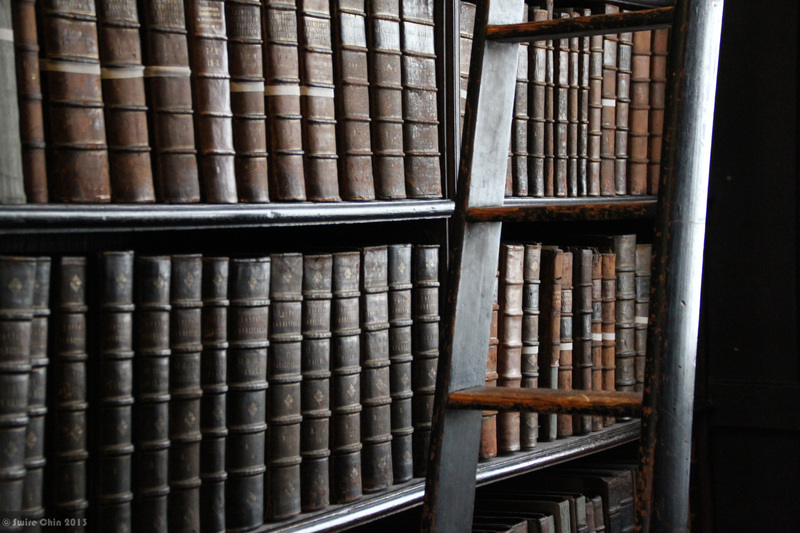 It’s designed for Interdisciplinary Studies students, and will include foundational theory as well as research methodologies and a new vision for the field that integrates open pedagogy into interdisciplinary scholarship. I started working on the book last year in my courses by asking students to blog about different topics we covered. They assimilated ideas from outside readings (all properly cited), from my lectures, and from active learning projects that we did. They also wrote about their own customized majors and applied capstone projects (service-learning/experiential/partnership-based) and how it all tied in with the foundational theories of the field. I just received a small grant from the University System of New Hampshire to develop this textbook. This summer, the plan is to take the student-created content (all of which is cc-licensed) and drop it into a Pressbooks shell much the way we did with the public domain literature in the anthology project. And in the Fall, students in the Interdisciplinary Studies (IDS) intro course will edit that material, create glossaries and short introductions, add assignments and writing prompts, and in-load multimedia supplements. In the Spring, the capstone students will augment the sections that relate to the practice of IDS in their field experiences, and link their own websites (we call them “ePorts”) into the book to demonstrate how different principles get applied in their curricula and practica. Students will also help me curate resource links for further reading, and locate other openly-licensed articles to import into the book. People often ask me how students can create textbooks when they are only just beginning to learn about the topics that the textbooks cover. My answer to this is that unlike many other scholarly materials, textbooks are primarily designed to be accessible to students– to new scholars in a particular academic area or sub-specialty. Students are the perfect people to help create textbooks, since they are the most keenly tuned in to what other students will need in order to engage with the material in meaningful ways. By taking the foundational principles of a field– most of which are not “owned” by any prior textbook publisher– and refiguring them through their own lens, student textbook creators can easily tap their market. They can access and learn about these principles in multiple ways (conventional or open textbooks, faculty lecture and guidance, reading current work in the field, conversations with related networks, videos and webinars, etc. ), and they are quite capable, in my opinion, of designing engaging ways to reframe those principles in ways that will be more helpful to students than anything that has come before. There is no rush! Don’t worry about producing a beautiful, flawless textbook. Build it in stages across multiple years, and let different cohorts of students contribute in different, layered ways. Make no claims to perfection. Your textbook is a work-in-progress, and it will continually improve as learners engage with it. Academic labor is labor. Students can help build the textbook if it’s a meaningful part of the learning process in a class. Outside of that, find funding sources to support students or instructors who want to assist with the development of the project. You don’t need to be a tech guru to do this. Learn how to openly license your book and learn how to get it online so folks can access and share it. Make sure you understand copyright issues so you can assure that everything in your book is freely available for you to use. The library is probably your best first stop for licensing questions, and your academic technology folks can assist you with getting a Pressbooks or website set up to host your textbook. Ok, so now that stuff is out of the way, let’s talk pedagogy. The $85 dollars that I saved for each of my students seemed to be the least of what was exciting to me about the open anthology (and that was pretty exciting, given that many of my students struggled to afford our previous book– to the point that it often took them weeks to raise enough funds to get their own copy). Let me start by telling you that no student in any of my classes ever told me that they loved our Heath anthology back when I was using it. In sixteen years of teaching the course, no student every remarked on a course evaluation that our anthology was the best part of the class. They tolerated it, often liked the helpful glosses, and sometimes loved the literature itself. But a textbook is a textbook, and they saw it as neutral at best, uninspiring or frustrating at worst. I didn’t really set out to make a better textbook. I was just looking to replace a textbook and save some cash for strapped students. Boy, did I underestimate the power of the open textbook. As students and alums worked with me over the summer to create that first skeletonic text, it was clear something amazing was happening. The students immediately seemed invested in the project– almost like they were, well, writing a book with me. To me, the work seemed sort of second nature, since I often write for publication. But for my students, the idea that they were creating something that would be read/used by a different cohort of students a few months later was a truly novel and thrilling concept. They repeatedly volunteered to work for free (I resisted this), and they still sometimes inquire about whether there are roles they can play now that the book is at its next stage of development. When the students in the class started working with and contributing to the book, they often made comments about liking our textbook! But by getting to contribute to the book, make curatorial decisions about the kinds of texts to include, and frame the work in their own words, they seemed more connected to the textbook itself, more willing to engage with it. Here’s a short video featuring several of my students, which explores their experience of using OER and engaging in open pedagogy-based learning. I also did something else that I think made a big impact on the class. I was sensitive to the fact that our new textbook would be digital, and that most students would not want to use up their print quotas by printing it out. I had read all the same stuff you have probably read about how READING OFF A SCREEN IS BAD and TAKING NOTES ON A LAPTOP IS BAD, but it occurred to me that both of these things have to do with the fact that we spend so little time parsing the differences between reading off a screen and reading print, and so little time examining how digital notetaking differs from handwriting our notes. My hunch is that it’s not that screen reading or digital notetaking are worse for learning, but that we don’t talk enough about what the digital texts enable that might be quite different from what is enabled by print. So I started the class with a consideration of the problems and potential of moving to digital texts, and with a challenge to the class to try to produce our own work–even our notes on the text– digitally, even if that felt awkward. We would assess at the end of the course which digital tools we would continue to work with and which we would jettison in favor of a return to the analog. So I added an app called “Hypothesis” to the course, which allows readers to take notes on the text digitally. Because we set our notes to “public,” students in my course (and in other courses at other colleges!) 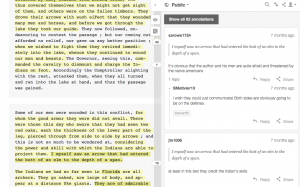 could see each others’ annotations and comment on them. Almost immediately, we all realized that it wasn’t the digital quality of the notes that was engaging; it was the social quality of the notes. Suddenly, our student-created textbook was turning into a cacophonous, heteroglossic tapestry of voices talking to each other about the literature. While it may very well be true that taking notes longhand can help students recall specific detail more effectively than taking notes on a laptop, the question of how digital annotation of a text differs from hand-written annotation seems distinct, and there is no question that there were certain dimensions that opened up when we allowed the annotations–allowed ourselves– to talk to one another within the context of the close reading. When I finally had time to sit down and take stock of what was happening, I realized a few things. The open textbook allowed for student contribution to the “master text” of the course, which seemed to change the whole dynamic of the course from a banking model (I download info from the textbook into their brains) to an inquiry-based model (they converse with me and with the text, altering both my thinking and the text itself with their contributions). The digital textbook meant they all had the book on Day 1 and nobody was behind, which seemed to level the playing field so we were all contributing more evenly than I had seen in the past. The fact that there were no limits on the kinds of things we could add into the textbook seemed to engender creativity in students, and allowed them to play to their strengths in figuring out what they brought to the table. This looked more like a real-world group project, in which team members would be asked to bring their talents to bear on some task. As all of this became more evident to me, I began to be more concerted about playing up the open pedagogy that was developing. I became more reliant on Twitter as a tool in our class, and worked to develop the class community on our course hashtag, with the idea that letting students feel connected to each other outside of class would help them begin to engage with the work more as scholars and less as students. I opened Twitter chats with working scholars, tweeted links to their own student blogs when they interested me (we worked mostly outside of the LMS), and encouraged them to share their own work across whatever social media platforms they enjoyed using. I also realized that my course was basically functioning as a MOOC (minus the “massive”–maybe it was a PMOOC: “Potentially Massive Open Online Course”). The text was free online. The syllabus and all assignments were online. The annotation system was publicly accessible, and the students were mostly all blogging on public websites that they built. Many class discussions had Twitter chats embedded inside of them, and any of the lectures I gave were livetweeted (pre-Periscope!). While we still had a sense of intimacy and trust in our classroom, it seemed to liven everything up to connect our work as scholars of history and literature to larger communities outside of that classroom. If OER is free, what hidden costs exist in using it that still hinder student access to education? For example, at my institution, 94% of students come to school with a laptop, which mostly means that my university wasn’t too worried about providing laptops for students because (as one colleague told me) “they all have them.” But all meant that in my 25-student classes, there were regularly 1-2 student(s) who didn’t have a machine. In order to do what I wanted to do with the digital textbook and the connected learning, I had to first work to get a laptop rental program installed in my library to ensure that my students all had access to hardware. I also had to spend a LOT of time going through each step of basic tech set-up. Because the “digital native” concept is (still a) fallacy, and because my institution does not fully cover basic electracy (I just learned that word from Gardner Campbell and Alex Reid) or digital literacy skills at the introductory level, I couldn’t shorthand things like “create a Hypothesis login” without immediately leaving some students behind. While I am all for letting students find their own way through the acquisition of specific tech skills, this self-directed approach to tech learning is something that has to be modeled and facilitated to ensure that students who are newer to technology can participate fully. Bottom line, opening one line of access to a free eBook doesn’t erase about a zillion other access issues that you will want to acknowledge honestly and assertively. If OER is free, what hidden costs exist in its production? Making these textbooks is taking me a chunk of time in the off-season. Thanks to my salaried position, I feel ok about putting in the overtime, but it’s a privilege my colleagues who teach under year-to-year part-time non-contracts can’t afford. Who should be funding OER creation? Institutions? Students? For-profit start-ups? How will you invest time in this project without obscuring the true costs of academic labor? Right now, we pass the corruptly high cost of academic publishing onto the backs of academia’s most vulnerable members: students. But as OER gains steam, we need to come up with funding models that don’t land us back in the same quagmire of exploitation that we were trying to get out of. Working in public is exciting and enriching, and I have seen my students thrilled by the connections they have made and engaged by the ability to produce work for a larger academic commons. That being said, working in public, and asking students to work in public, is fraught with dangers and challenges. Students need to understand privacy and safety issues (and so do we; in case you haven’t had FERPA waved in your face recently let me do that for you now). They may not know about trolling or how to respond to it (seriously, we can’t even say there is a universally agreed-upon best practice for handling trolling). They may (will) face vicious harassment, racism, sexism, homophobia, and all of the other things that we do a reasonably good job at regulating in our classrooms (maybe? ), depending on the kind of work they do or the kind of digital profiles they put forward, purposefully or otherwise. They will put crappy work online sometimes (sometimes they will know it’s crappy and sometimes they won’t); is that ok? Will it come back to haunt them when they look for a job (we need to take this concern seriously, given the debt they incur to study with us)? What professional risks do I assume when my pedagogy is so fully exposed? And who in the academy can afford to take those risks…and who cannot? So yeah, that’s only three bullet points, but there are so many threads embedded in each of those, I think I will stop there. Do you use an open textbook? If so, what’s that “open” part doing to/for your course? If you want to try incorporating an open textbook into your course but haven’t yet, what questions do you have before you’d want to give it a go? There are so many things for me to like in your post Robin, that it would exceed its length to describe. You’ve made the process extremely approachable and pedagogically sound, and the idea of students co-creating their textbook (and each year perhaps building upon the last). It’s right out of “the book” of David Wiley’s answer to what he calls “disposable assignments”. And its a small thing, but what a thrill (hopefully) for your students to see their names as contributors in the front page. The thing that leaped out to me follows on an interview I did 2 years ago with a community college Physics teacher who talked about the different from using publisher produced content vs what he pieced together himself from OERs… and I am not sure I come across what must be obvious to people like you that have done this. What David told me was his energy, enthusiasm in the class was at a much higher level with the OER approach. Sure we choose the polished “professional” textbook because of its assumed high standards, quality etc, but then its a more passive relationship a teacher has with it. I make the comparison to growing and/or making your own food versus having it prepared or taking it out of a package. Having produced our own food means we know everything about it from top to bottom, and the pride in doing that has to make the whole experience much more energized. So a subtle outcome of producing one’s own course materials is having a personal relationship with using it, and that IMHO cannot help but be energy that feeds off of teachers that students receive too. This is just wonderful and even magic, not only because of the inherent power of co-production in its most genuine form, but also because of the humbleness with which the project is approached. I have been thinking in starting this as a course project in ed studies and i am hopping to learn much from you Robin, and from Alan’s workshop in the DML conference (october) Iam applying to go. These are exciting and challenging times to be a teacher and a curious researcher! Thank you for your generosity, humbelness and wisdom Robin, i bow with admiration and respect. I hope we could work together some time 🙂 so much to learn from you and your students! Many thanks for a really useful post – it sounds like it’ll be a bit of a wrench to leave that group, yet also a really good example of “open” – to be able to pass it on to whoever is teaching that unit next academic year. It’s looking like a worthwhile extension of the idea of getting students to create / update Wikipedia articles as coursework; without the attendant fear of it all disappearing due to some random strangers’ whims. Indeed, Emma! The idea of sharing resources and selection of educational materials, in particular, is quite excellent. Through passing the gained experience to others, we provide them with an opportunity to avoid some mistakes and also improve the general condition of the way they teach, as good teaching requires a constant development and work. This is such a useful, inspiring post! I especially appreciate the articulation of the challenges and issues we need to be thinking about as we move toward “working in public.” I faced the issue of “all” students having a laptop this semester when one of my students didn’t have one and, unfortunately, I didn’t realize it was an issue until part way through the semester. I hadn’t made the accommodations as explicitly available as I thought I had and so this student suffered in silence without me realizing it until he exploded in class one day. Ugh. I still feel so badly about it. But we will all get better at this if we keep talking about the pitfalls as well as the benefits. Thanks for keeping the conversation going!! This is just good pedagogy. You have attended to the “content, process and products of learning” (Tomlinson) in designing your course. “Authentic” learning experiences always produce the best engagement, opportunity to build new knowledge, and retention. This is what is meant when we talk about being a “guide on the side” vs. a “sage on the stage.” Learning is active; not passive. And assuming that in our digital age literacy includes the ability to critically research digital content, to synthesize and apply it to a unique problem and to produce new usable and dynamic knowledge, you’ve created the highest quality educational experience for your students. To me it has little to do with saving textbook money because it is so much about quality pedagogy– what we should be doing anyway as educators. But you’re right that there is an economic cost for producing quality educational experiences and that kind of work seems to be at great risk. I keep coming back to the question of how we can protect the ultimate economic viability of intellectual work in the digital age. Thanks for your great article. As a fellow educator, I would be interested in more about your specific strategies to build quality controls into your collaborative student work. To echo others, thanks for a very thoughtful and stimulating account of your experience with (and ideas about) Open Pedagogy. Your “ugh” post opened some minds to the limits of thinking in textbooks. This one keeps us inspired to push forward. Maybe, little by little, the movement towards Open Education has less to do with the cost of textbooks and more to do with heutagogy? Just a thought. For the record, been mentioning this post quite a bit. Funnily enough, it came back during a recent discussion (on Montreal’s #OpenEDU camp), from someone who may have read it without my intervention. So, either it’s “in the air”, or there’s something to be said about the Social Buttefly Effect. * how can we make sure every students truly has access to the resources they need for creating in a digital space? * what are the hidden production costs (in any OER development)? * how do we prepare students (and support them) to work in the open? These questions will likely take some time and varied approaches to unpack and respond to but, as you’ve so beautifully described in this post, the learning is worth it! You are making an impact on a resource we are developing for faculty and students at UBC to learn about open practice: http://open.ubc.ca/ We’ll definitely add this post to the must reads for the Why and How of teaching in the open. Thank you. 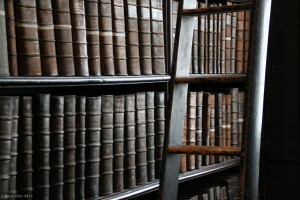 Pingback: Student authored textbooks… in the language classroom? Thanks so much for sharing this! I had my students work in groups to create mini critical editions of a public domain text we studied in the classroom this semester in my Introduction to Hispanic Literature and Culture, and now am working to publish their CC-licensed projects in an open textbook. I was thinking of using Scalar but am now looking into PressBooks. Do you happen to know both platforms? What are the best parts of Pressbooks? I don’t work with Scalar, but maybe other readers can offer feedback there. PressBooks is WordPress-based, so if you know WP, it’s very easy to use. It is easy to share the book, easy to edit and reorganize it, and easy to add multimedia. Rebus is a new community emerging to use PressBooks to allow multiple collaborators to work on books together (PressBooks isn’t so good for this on its own right now). If you’re interested in PressBooks, I’d recommend just starting to build a book (it’s free) and play around for a bit and you will get the hang very quickly. But I have students do the kinds of things you’re talking about, then I just copy and paste them into PressBooks to build really nice, professional-looking flexible books! Thanks! I have great information from students to copy and paste so I will get started playing around on PressBooks as you suggest. 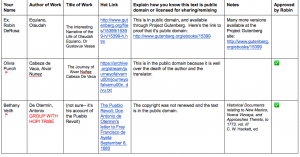 Now I wish I had had them create the content before the class studied the texts, as you did–what a great idea! Pingback: Pragmatism vs. Idealism and the Identity Crisis of OER Advocacy – Rajiv Jhangiani, Ph.D.
Robin, this is a really interesting and informative post that has really made me think about my context – training professionals from a range of disciplines on how to operationalise a respect for human rights in their work. I imagine that this approach could be used to generate and revise multi-disciplinary guidelines that can be used by NGOs, law enforcement and the judiciary alike across many countries and contexts. My question would be: I see that you were the editor for your open textbook. How do you see the role of an editor in this sort of open process? Do you use some kind of Wikipedia approach of reviewing and approving changes? How did you and your fellow authors negotiate differences of opinion? Inspirational idea and blog post! Really useful to summarise potential challenges as well as the positives in terms of pedagogy too. Incidentally, I was directed to read this post as part of a PG module in openness and innovation in education at the Open University. Just thought I’d mention this as a kind of uninteded educational benefit from your project. I was inspired by your post to investigate hypothes.is. I hope you don’t mind me asking for ‘technical support’ here! I have registered with hypthes.is but the public annotations that I make using the tool seem to require readers to also be registered in order to read them. I coud access yours though, without registering. I can’t seem to find anything about this difference on the hypothes.is site. 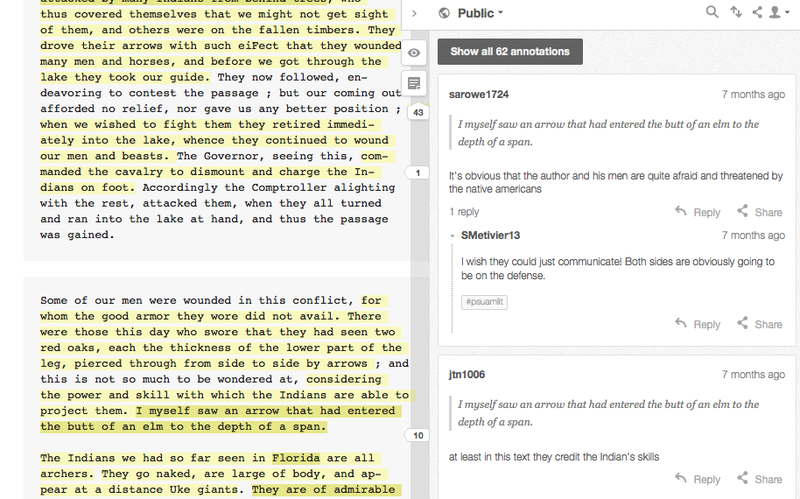 Anyone can see annotations that are public, even if they don’t have a Hypothes.is account. HOWEVER, they will have to turn Hypothes.is on on any website that they want to see annotations for. This means they need to click the icon on the plug-in on the toolbar if they have installed in (usually what you would do if you have Chrome) or click the bookmarklet if they are using that (Firefox and other browsers I think mainly still use the bookmarklet). Rarely, you will see a website is always already turned on, and that means that the sites owner has built it into their site (as I did on my blog, using a WordPress plug-in). So in general, though you don’t need an account to see annotations in Hypothes.is, you do have to turn on Hypothes.is on any site that you want to use it with. Does this help? Thanks very much for the response. Ah, OK, so I need to turn hypothes.is on, on teh page itself. Thanks! I am visiting this post for the thousandth time, today, and was surprised to see that there weren’t already comments on it. You asked a couple of questions at the bottom of your post that I thought I would answer now. I haven’t ever written or even used an open textbook, but am intrigued by the possibilities. I have been considering having my doctoral students co-write a text together, as a part of a technology and leadership class I’ll be teaching this Fall. My concern is that even though I’m the third class they have in their cohort, I’m often the first that starts them using a references manager (for many, it is their first time, which astounds me… but, that’s a factor I have to consider), blogging, Tweeting, and many need serious help brushing up on citing sources, etc. I know this class can be overwhelming for them, since many of them come into it with the mindset that they aren’t technical and aren’t going to enjoy themselves. We are usually past that by the end of the class, but there’s definitely a season of frustration that often occurs. I don’t want to overload them with tools and new skills, yet they do each write a research paper about some topic that intersects with technology, leadership, and education. Bringing their work together as a textbook seems like something they would look back on as a fantastic accomplishment. I also wonder if we would be better off building it as something to be consumed digitally, or try to gear it toward being eventually printed as a paper book. I can envision the next time I taught the course, assigning the book as a textbook and then having them add to it, as you suggested in your post. It seems like it would be fun, if they prefer to read things in printed form, if they could order a hard copy from some print-by-demand service. Yet, also, the idea of linking to videos of them sharing about a topic seems really powerful, as well. I’m am curious if I have to think in either/or terms, or if there is room for either option to work (with a screenshot of a video in the printed version still allowing a person to go online at that point, if they wanted to). Thank you for writing this post. I have read it so many times and each time get something new out of it. So much of this comment resonates with experiences I have teaching– In particular, when I start my courses, I am spending about two good weeks on tech set-up and new tools, and introducing students to Open Ped, and it can feel overwhelming for sure. It takes time from course content and sometimes stuns students with less tech experience. But I try to do this as part of a longer game: reorienting the learning towards inquiry; establishing that the creation of course architecture is part of the value of the course and of their educations; and encouraging learners to feel more comfortable with challenges that are outside of their prior knowledge base. I’ve come to find these two weeks to be the most important in the course, and have gotten better at building in supports for the very different ways students react to the tech overload and the new format for learning. But anyway, just wanted to say that because in philosophy the tools are so secondary to the pedagogy, I totally feel that tension of spending so much early time focusing on the nitty gritty of tools. I have been thinking about the print-digital gulf that seems to exist in conversations, in particular about OER and open textbooks. 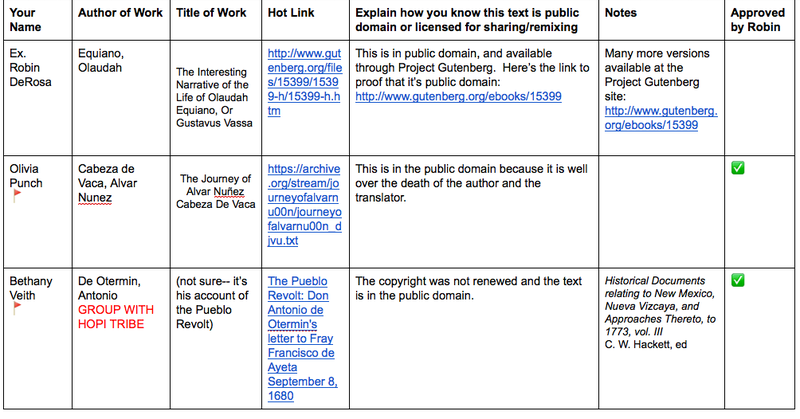 I definitely think helping students see print and digital texts as existing on a technology plane (in that both are technologies) together is more helpful than choosing between them on a course by course or assignment by assignment basis. We switch between mobile and computer and between scrap paper and notebooks, and we switch between apps all the time as we study and work. I think knowing out how to choose technologies based on what our human needs are is an incredibly useful skill, so it’s awesome to me when students insist at times on print, or identify a way that a digital text offers something they really want or need in a reading experience. I wonder how we can think of print and digital more flexibly, and help print feel more open (in a 5R sense) and digital feel more tactile and familiar to work with. Print on demand is a great option for many students– and faculty– for reasons too numerous to even list here. So I am a big fan for sure. But it’s funny how that 2 week overwhelming techie time has become kind of lever for me to flip to help students snap out of the business as usual mentality. I think building course tools in a new way makes course tools visible (the HOW of teaching, not just the WHAT), and I so enjoy having students in that space with me. Thanks for a comment that gave me loads to chew on!